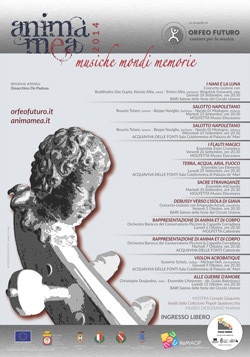 The fifth edition of this festival dedicated to baroque and contemporary music takes place in Puglia under the artistic direction of Gioacchino de Padova. Featuring over 200 talented musicians, each a specialist in their field, the 30 Anima Mea concerts take place in some of the most evocative and architecturally interesting locations in the region. Orchestra in residence is Orfeo Futuro which has created the largest organic baroque-choral orchestral group ever to perform in Puglia. The musical director is Alessandro Ciccolini.